In a new series of interviews with Game Informer, Nomura mentions that there are still more Disney worlds to reveal, and talks about DLC! You can check out the full articles here and here. We will update if more surface. UPDATE: An additional part of the interview has been added, speaking of Final Fantasy, Ratatouille and Aqua's popularity. "I can’t really talk about any of the characters that have not been announced or shown yet, but just looking at Kingdom Hearts 1 compared to when that was released, there’s so many different titles with Final Fantasy characters or where all of these characters come together. I don’t feel that much of necessity of bringing these characters together like I did before. However, if you could look forward to information in the future, that would be great." Kingdom Hearts III releases January 29th, 2019, worldwide, on the PS4 and XboxOne consoles. Follow Kingdom Hearts Insider on Facebook, Twitter, and Tumblr for the latest updates on Kingdom Hearts Union X[cross], Kingdom Hearts III, and all things related to Kingdom Hearts! Woohoo! This confirms there's 2-3 worlds left to show off not including the original worlds, which is probably where 100 Acre Wood will come into play. I have my choices but I'm glad there's still a few more Disney Worlds left to reveal. Looks like the 9 Disney worlds and 4 original worlds is likely. 10-11 Disney Worlds. RG, TT, DT, KB for OG worlds. Makes it in total more then KH2. Remember they said there's 3 arches of worlds. Beginning, Middle, End. 100 Acre Wood does not fit in this scenario considering it's housed in Radiant Gardens. So you still have 2-3 more Disney Worlds remaining not including 100 Acre Wood. 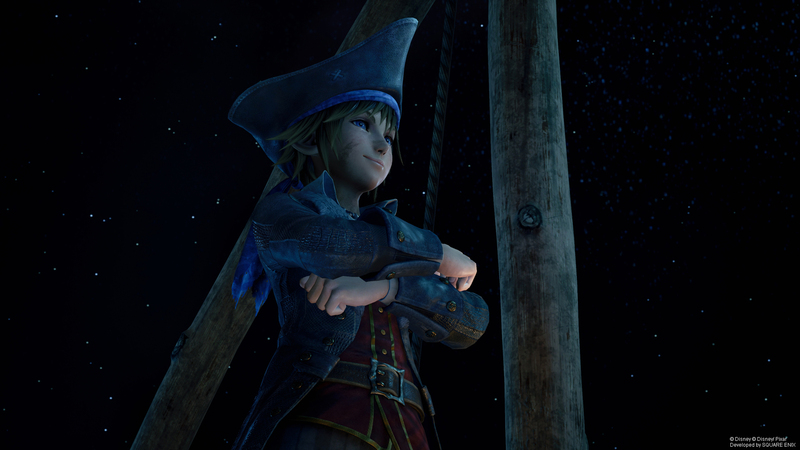 Nomura said there's less Disney worlds than KHII. Yes I know that and have been saying that when people say it'll only have 8 or 9. It's not gonna have less then or the same as KH1 not gonna happen. 10-11 makes it less then KH2. But when you add on the OG's it makes it more worlds total then ever before. Which is what Nomura has basically said in interviews. That KH3 has more worlds total then ever before in the series. More new worlds, more original worlds returning, worthwhile DLC in the future, and no Season Pass. Kingdom Hearts 3 is looking more promising everyday. It might just become my favorite game in the series if the story is good. For every world, there's a Seeker of Darkness dabbling in it (with the exception of Twilight Town having two, but that's probably because 100 Acre Wood is returning), so having 13 worlds just makes too much sense. It fills Nomura's ODC itch. Also, if we look at Kingdom Hearts III as the extension to Kingdom Hearts 3D, you see that we have 7 sleeping worlds from the former game and 13 regular worlds in this game. So we have seven Disney worlds confirmed and one known through leak. I was hoping for a numbered estimate, but he did say some were left. Maybe two more in addition to 100 Acre Woods? Note: Since Pirates of the Caribbean has been Chosen to return for Kingdom Hearts 3 it's likely that Treasure Planet won't be coming for Kingdom Hearts 3 since Roy Conli has Two of his Movies and it looks like Treasure Planet won't make it in the Game so we're stuck with Tangled and Big Hero 6 so no Two Pirate Worlds. I'm satisfied with the number of worlds, I'm just CRAVING some more worlds crafted from traditional 2D films at this point. Nomura, plz. So 14 worlds total then, because like you said 100 Acre Wood wouldn't have combat nor a seeker of darkness in it. Which leaves us with at least 2 Disney Worlds left not including 100 Acre Wood. And I really hope those final 2 films are 2D animation and one is a classic film and not a recent film. PATF and The Jungle Book. Though I'd kill for Robin Hood. So i'm expecting 10 disney worlds, which means 3 left to reveal+big hero 6 gameplay, sounds about right when 7 months left to release. So what do we think are the final 2-3. I hope it's 2D animations world, I don't think we need another Pixar. The only one I'd want is The Incredibles as it'd be amazing to have all the Par family as your team mates. That'd be incredible. I want old school Disney Classic Jungle Book and maybe Princess and the Frog or Atlantis. Since Xehanort apparently wants to make new PoH, it's possible at least of the last two could go to a Disney Princess film. Princess and the Frog? As for the last one, I think it could be Jungle Book. Kida really does seem like a good fit. Just wait for the heart to take her and dip. Princess and the Frog seems to get more and more likely, which I'm getting way too excited about!! As for the final world, I could honestly see maybe something like Atlantis making it in, not sure about Jungle Book (though I would love that world). 9 Disney worlds. 4 original worlds. One for each Seeker with the exception of two being in Twilight Town and all in Keyblade Graveyard.